Many of the negative impacts caused to Bali since Mount Agung erupted the second time this year. Mount Agung erupted first in September 2017, and the second time on Saturday, November 25, 2017, 5:20 pm. Until now still showing the eruption with bursts of ash and dark smoke. There was a red glow at the top which was the flame of hot lava. Gunung Agung still continues to experience magmatic eruptions. Various changes have occurred, following the eruption and volcanic ash are still being issued by Mount Agung. The impact of the eruption of Mount Agung, local authorities called on the Balinese to wear masks while traveling or being outdoors. NASA's Aura satellite has monitored the high concentration of sulfur dioxide (SO2) in the sky around the island of Bali. 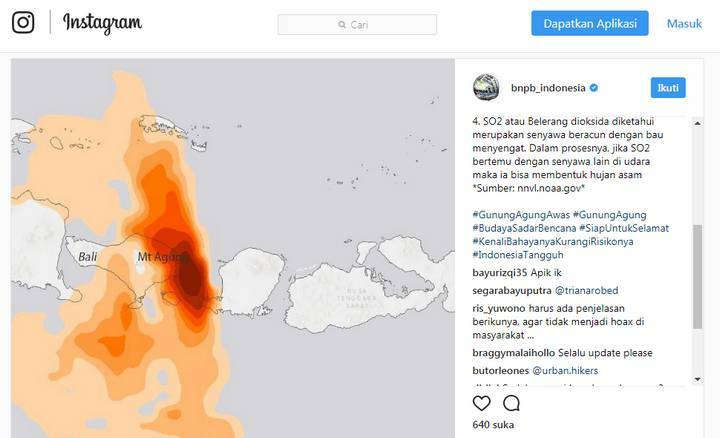 Sulfur dioxide content is detected since Monday, November 27, 2017, detected in the sky Island of Bali, part of Java to Surabaya and the Madura Islands. Its intensity is high and can make the sky more acidic and very dangerous if inhaled directly. The ash concentration impact of the eruption of Mount Agung is the highest found in the East of Bali Island. Once released normally SO2 or sulfur dioxide may turn into small aerosol sulfate particles. This can change the brightness of the cloud and affect regional precipitation patterns. SO2 is a toxic compound with a strong odor. Chemical reactions that occur when SO2 meets with other compounds in the air then these compounds can form acid rain. Volcanic ash spread from the magmatic eruption of Mount Agung until now still blanket air space. Even had blanketed the sky above the airport I Gusti Ngurah Rai. Until there is airport closure for flight safety. The negative impact for Bali from volcanic ash in the air is a disturbed flight. Residents who are hard-working outside the home for fear of polluted air can be inhaled. Even ash rain has occurred near the mountain with a radius of up to tens of kilometers.